It is a waffle that is partially cooked in a waffle iron, then deep fried and frosted like a donut. It is available at Waffles Cafe in Chicago and it has made me very excited that I am signed up to run the Chicago marathon because 26 is probably the number of miles you need to run to burn off the calories in the number of these I intend to eat. If doughnuts aren’t your thing but your inner Leslie Knope desires more waffles, fear not. Dominique Ansel, culinary mastermind behind the cronut, has another new creation. Waffogato is vanilla ice cream molded into a waffle shape, with espresso poured over it like affogato. Fortunately, if you can’t make it to NYC or don’t wish to brave the lines at Dominique Ansel, espresso poured over the ice cream or gelato of your choice will probably get you the same delicious effect. It’s a creme brûlée doughnut stuffed with ice cream, and it’s made by Astro Dougnuts in DC. 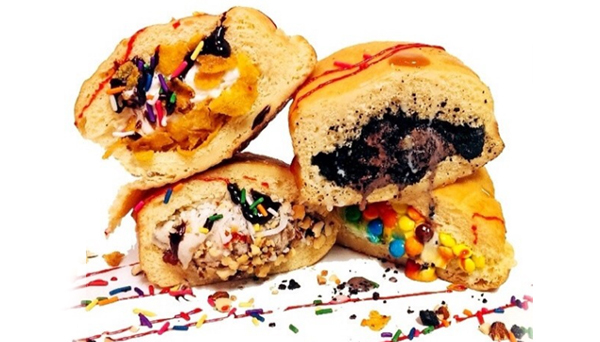 You get a doughnut filled with your choice of ice cream, which comes in flavors like cookie butter and churro. Yes, please. If you don’t live near any of these places, may I suggest sandwiching a scoop of ice cream between a waffle and a doughnut, then pouring a shot of espresso over the whole thing? Yes, it might be terrible, but it also might be the best dessert ever.